How many people devote as much time to their prayer lives and relationships with God as they give to the care of their minds and bodies? What would happen if you gave just fifteen minutes of your day to God? Would your life change? EXERCISING YOUR SOUL is a spiritual fitness program, a guide to firming up your faith that offers practical techniques to recharge and enhance your relationships with yourself, with others, and most importantly, with God. Drawing from spiritual practices from Christian traditions that have transformed the lives of millions throughout the centuries, the prayers and exercises in this audio book are powerful ways of experiencing God in your day-to-day life. 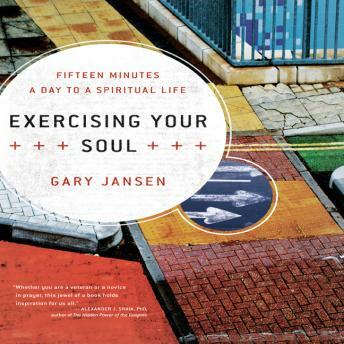 With a style that is personal and engaging, author Gary Jansen brings to life each of the practices he suggests as he shares his own growth through the disciplines. With beautifully told modern-day parables and stories, EXERCISING YOUR SOUL makes complicated concepts simple and exquisite. it is the antithesis of a self-help book, Jansen explains; it is rather a "God- help book," one that places God at the center of all things and will change your life forever.